My internet has been down for 2 days… believe it or not I’m sitting in J-B’s back yard stealing his WIFI as I write this!! This haiku is so me right now. Far, far too many thing. What a way to get an internet connection. LOL Have a wonderful week. Yeah it was pretty funny when he got home, found my vehicle in his driveway, but couldn’t find ME! :) Good thing he has a covered porch too, because it was raining cats and dogs. Don’t break! Slow down and take a deep breath. i have learned that even blogging can wait. i have to take care of me. Easier said than done, but very true :) Blogging is the least of my stresses right now though! I have found that focusing on one thing at a time reduces stress. Multitasking is very bad. Yeah, I have one major contract that needs my undivided attention this week. Now that my net access has been fixed I’ll be spending the rest of the week on that. “just have to get through…” should be my “national anthem’s” title. you nailed it, jenn. 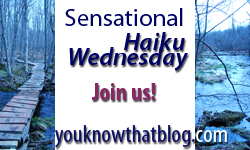 I stressed just putting this haiku together this morning! LOL! I have finally found that by giving myself limits each day I reduce my stress! I multi-task at school as much as possible to reduce bringing home work! I think I need some better time management, personally. And better goal setting. It’ll work out – always does. So, we address the “stress” mess . . . . Although, a little added pressure (like writing Haiku!) can be helpful at times. Well you helped relieve a lot of mine this week; thanks! I am the opposite of Nessa, I multitask because it gives me the feeling of control but everyone is different! Hope everything calms down for ya Jenn! Enjoy this process so much, and your haiku. Stress is inserting photo into post and not being able to correct line breaks. Oh well. Underlying stress there is often serious fears…especially with family! I’ve been away for a while but now I’m back. Here’s my entry. Danger is in the alley. ACK!!! Look how late I am!! Geez Louise…. Well, at least I got my haiku in today, as promised! Happy you made it, even if you were tardy ;) It’s all good, my friend! Your prompt is something all of us have a lot to express!